This is a happy day, adoption day. Kenton is dressed in a navy blue jacket and tie. A solid, average sized 10-year-old boy, his light brown hair is cut short. A small cowlick forms a circle in the center of his forehead. My father, his new Pappaw, has spent the morning teaching Kenton to tie the knot in his new plaid tie. Kenton seems itchy with excitement, ready to be adopted. I hug my soon-to-be nephew and breathe him in. He smells like boy, a mixture of fresh grass and dirt, like the earth, if the earth used hair gel. “Are you excited?” I ask. Kenton came to live with my brother John, his wife Leslie, and their two daughters, 19-year-old Casey and 16-year-old Emily, nine months ago. He was a pre-adoptive child. His birth mother’s parental rights were in the process of being severed by the court. He carried all 10 years of his life in two small laundry baskets. His most treasured possessions: a four-leaf clover, a small dried up starfish, and a piece of white quartz, all secured safely in a Ziploc sandwich bag. He asked my brother John and my sister-in-law Leslie two questions when he arrived. I am sitting next to Kenton in the waiting room designated for family court. I feel nervous, courtroom nervous. It is the same feeling I get when a police car is behind me and I haven’t done anything wrong. Kenton holds a multi-colored Mylar balloon tied to a small gift bag. “Who gave you the balloon?” I ask. He points to a pretty young Asian woman in a beige dress with black high heels, standing by the door. Case-workers, DSS, foster care. Kenton talks about these things like my children talk about a coach or a teacher. My children think visitation means grandparents are coming, not supervised weekly visits with mom. Kenton’s words make me sad but this is what he knows. He has been in the foster care system for most of his life. “Fifty-three dollars and sixty-seven cents—weird, right? It’s money left over from foster care. Weird, right?” he says, looking confused. “Well, I guess they could have rounded it to an even fifty-four dollars but, hey, it’s ‘found money’ right? You get to spend it however you want,” I say. “Yep.” He shrugs and walks away toward my mom, his new Grammy. I am struck by the casualness of this conversation. Case-workers, DSS, foster care. Kenton talks about these things like my children talk about a coach or a teacher. My children think visitation means grandparents are coming, not supervised weekly visits with mom. Kenton’s words make me sad but this is what he knows. He has been in the foster care system for most of his life. He is a study of innocence lost, detoured by sharp turns, rough surfaces, and shadowy tunnels. Yet he is resilient, eager to trust this newly paved road of love and permanence. 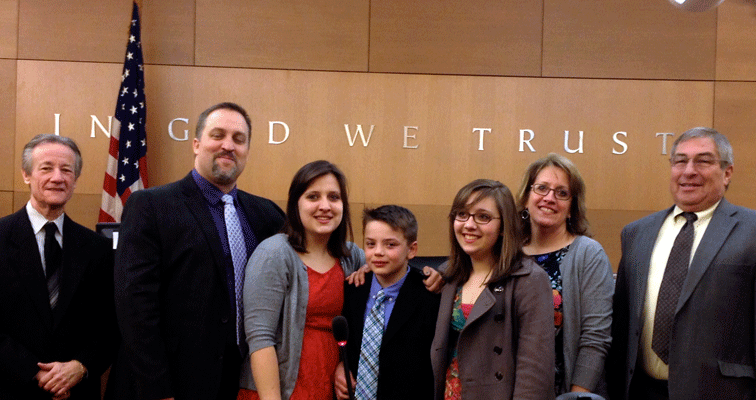 I am one of 17 family and friends present to witness the adoption of Kenton. My mom and dad have traveled from Florida to be here. We sit together in a large waiting room. It is divided down the middle; 40 plastic brown seats face 40 more plastic brown seats. We are early, a bit fidgety and, in our attempt to be quiet, we are whispery loud. I think about Kenton’s birth mother. How she sat in this same room waiting to sign the papers that would end her parental rights to her only child. The ache in her mother heart must have been unbearable. Did she feel guilty, hopeless, sad, afraid? She is an addict. The system has given her years to get clean. It has given Kenton at least four foster homes. This last thought makes me angry. I don’t know how long it should take, but 10 years is a lot of childhood. Kenton’s case is called. “This has to be a record,” the judge notes as all 17 of us file into family courtroom number nine. The judge wears a casual beige suite and looks a little like Mel Brooks. We sit on two long pews in the back of the room. Kenton sits between my brother and sister-in-law at a long table. The judge sits facing them on their right, the adoption caseworker and attorney for the state on their left. I think about Kenton’s birth mother, how she sat in this same room waiting to sign the papers that would end her parental rights to her only child. The ache in her mother heart must have been unbearable. Kenton looks a little smaller now; his shoulders rise just above the table. His hands are folded neatly. From the back he is a mini replica of my brother, both hunched forward in matching navy blue blazers. John and Leslie are sworn in. The proceedings take an hour. All the paperwork has been signed in advance, but must be reviewed. The caseworker and the attorney for the state stand and recommend the adoption. The judge addresses my sister-in-law. “No,” she says with quiet confidence. “Well, it has been a fun journey so far,” John pauses, “and, I’m looking forward to the rest of it.” He laughs and smiles at Kenton. “You not only look like your dad, now you talk like him.” The judge smiled. “Well, I do believe this is a match made in heaven,” the judge says. He pauses and stares at the inscription, In God We Trust, on the wood paneled wall in front of him. Then he signs a few more papers and the adoption is complete. The details of Kenton’s first 10 years—the years between the hoping and the coming true—are in a file that will be sealed by the court today. “I wish I was born in your belly,” Kenton says to his mom on the way out of the courthouse. She stops and pulls him close. Satisfied with the answer, Kenton turns and jumps up on his new big sister, Casey. She piggybacks him to the car. This essay was first published in Brain, Child: The Magazine for Thinking Mothers. All rights reserved.